High yield paper default rates seem to be on the decline, at least on a month to month basis. 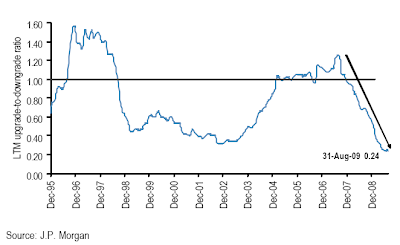 The slowdown in defaults has definitely been helped by the new demand for corporate bonds. 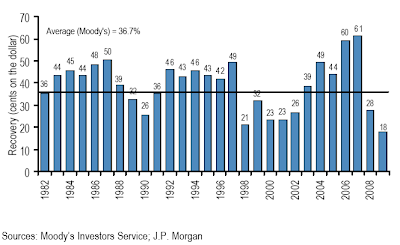 But let's take a step back to see the bigger picture of what has actually occurred in the high yield market based on some data recently published by JP Morgan. We've been here before in 2002, though maybe not to the such extremes. The movie is being replayed. 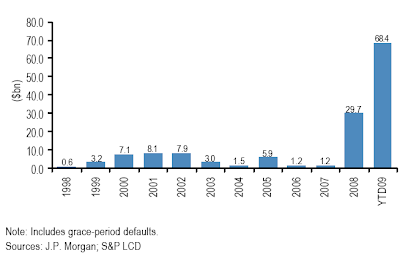 Default rates have so far not broken the 2002 record. 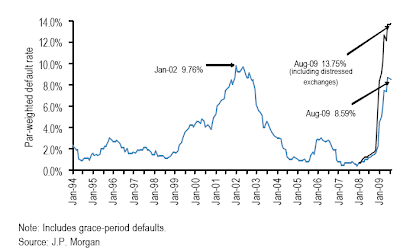 However if one includes transactions in which creditors had to exchange their bonds for other (often worse) paper to prevent a default ("distressed exchanges"), we've definitely cracked the 02 default rate record. 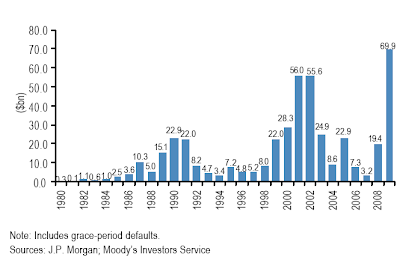 In terms of absolute dollar amounts of defaulted paper, the current level is also a record, with nearly $70 billion of HY paper defaulting in 09. The chart below actually includes the first HY cycle (we are now in #3), from the days of Drexel Burnham. 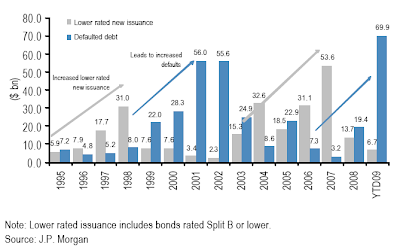 In addition to these HY bond defaults, nearly the same amount of leveraged loans defaulted in 09, an unprecedented level for that market. Recoveries have reached record lows, wiping out junior tranches of structured credit transactions, such as HY CDX tranches. Not that ratings mean a whole lot in this space, but it's still interesting to see the ratio of upgrades to downgrades collapse to near zero. One of the most striking aspects of the high yield debacle is that Wall Street never learns. Perhaps another way to put it is that people who do some of these deals know darn well that the transaction is over-leveraged, the company is stretched thin, and the movie will not end well. Yet they do the deals, get paid, and leave the mess behind for others to clean up. The chart below shows two cycles of new deal markets overheating, as increasingly higher volumes of more aggressive, lower quality transactions got done. Shortly after, we have a spike in default rates and the movie replays it's bad ending.